Challenge five unique areas with 25 exciting levels. Save Bikini Bottom from its biggest threat in a madcap adventure made just for kids. Kids ages 6-14 can explore 25+ wacky battle levels and destroy-and-demolish challenges with characters from the award-winning, top-rated Nickelodeon animated series, SpongeBob SquarePants. Providing hours of fun and exciting game play, this game allows kids and their parents to experience SpongeBob in a whole new way. We are big SpongeBob fans in this house, we've seen pretty much every episode at least once, if not more. So playing a game based on the series was exciting for us. This one however I think was definitely geared towards the 6-14 age group. I tried to play it myself and found myself losing interest after a few boards. My kids however 5 and 11 kept right on playing for the next hour or so, and have played it again and again since then. So I guess they really hit the target age group with this one. My kids sure liked it and will continue to play it. Buy It: SpongeBob and The Clash of Triton is available immediately for $19.99 at major retailers including Office Depot, Amazon, Fry’s, and Microcenter and online. The software is compatible with Microsoft Windows® XP, Vista® and 7. It requires 512 MB of RAM, 1 GHz or faster processor (or equivalent) and a CD-ROM drive. 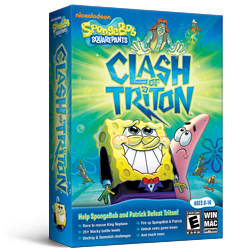 SpongeBob and The Clash of Triton is rated E for Everyone. Probably won't be playing this game but I do love Sponge Bob! We love Sponge Bob in our house! Stumbled you!